Reading and share top 43 famous quotes and sayings about Self Assurance by famous authors and people. Browse top 43 famous quotes and sayings about Self Assurance by most favorite authors. 1. "The poet exposes himself to the risk. All that has been said about poetry, all that he has learned about poetry, is only a partial assurance." 3. "Confidence and empowerment are cousins in my opinion. Empowerment comes from within and typically it's stemmed and fostered by self-assurance. To feel empowered is to feel free and that's when people do their best work. You can't fake confidence or empowerment." 4. "Like the Baron, Mathilde developed a formula for acting out life as a series of roles—that is, by saying to herself in the morning while brushing her blond hair, "Today I want to become this or that person," and then proceeding to be that person.One day she decided she would like to be an elegant representative of a well-known Parisian modiste and go to Peru. All she had to do was to act the role. So she dressed with care, presented herself with extraordinary assurance at the house of the modiste, was engaged to be her representative and given a boat ticket to Lima.Aboard ship, she behaved like a French missionary of elegance. Her innate talent for recognizing good wines, good perfumes, good dressmaking, marked her as a lady of refinement." 5. "Although some of the people at church rejected and even denounced me, this did not particularly hinder me in my search. Rather, the fact that there were church people as weak and foolish as I was myself gave me a deep sense of reassurance. Arrogantly I thought, 'If God accepts that sort of person, isn't it possible thatHe will even accept me?' And I began to read the Bible more attentively." 6. "All this is flashy rhetoric about loving you.I never had a selfless thought since I was born.I am mercenary and self-seeking through and through:I want God, you, all friends, merely to serve my turn.Peace, re-assurance, pleasure, are the goals I seek,I cannot crawl one inch outside my proper skin:I talk of love --a scholar's parrot may talk Greek--But, self-imprisoned, always end where I begin.Only that now you have taught me (but how late) my lack.I see the chasm. And everything you are was makingMy heart into a bridge by which I might get backFrom exile, and grow man. And now the bridge is breaking.For this I bless you as the ruin falls. The painsYou give me are more precious than all other gains." 7. "Naturalism is a picture of the whole of reality that cannot, according to its own intrinsic premises, address the being of the whole; it is a metaphysics of the rejection of metaphysics, a transcendental certainty of the impossibility of transcendental truth, and so requires an act of pure credence logically immune to any verification (after all, if there is a God he can presumably reveal himself to seeking minds, but if there is not then there can be no "natural" confirmation of the fact). Thus naturalism must forever remain a pure assertion, a pure conviction, a confession of blind assurance in an inaccessible beyond; and that beyond, more paradoxically still, is the beyond of no beyond." 8. "A person with ubuntu is open and available to others, affirming of others, does not feel threatened that others are able and good, for he or she has a proper self-assurance that comes from knowing that he or she belongs in a greater whole and is diminished when others are humiliated or diminished, when others are tortured or oppressed." 9. "Ubuntu [...] speaks of the very essence of being human. [We] say [...] "Hey, so-and-so has ubuntu." Then you are generous, you are hospitable, you are friendly and caring and compassionate. You share what you have. It is to say, "My humanity is caught up, is inextricably bound up, in yours." We belong in a bundle of life. We say, "A person is a person through other persons."[...] A person with ubuntu is open and available to others, affirming of others, does not feel threatened that others are able and good, for he or she has a proper self-assurance that comes from knowing that he or she belongs in a greater whole and is diminished when others are humiliated or diminished, when others are tortured or oppressed, or treated as if they were less than who they are." 10. "Thrice happy she that is so well assured Unto herself and settled so in heart That neither will for better be allured Ne fears to worse with any chance to start, But like a steddy ship doth strongly part The raging waves and keeps her course aright; Ne aught for tempest doth from it depart, Ne aught for fairer weather's false delight. Such self-assurance need not fear the spight Of grudging foes; ne favour seek of friends; But in the stay of her own stedfast might Neither to one herself nor other bends. Most happy she that most assured doth rest, But he most happy who such one loves best." 11. "She smiled at him, making sure that the smile gathered up everything inside her and directed it toward him, making him a profound promise of herself for so little, for the beat of a response, the assurance of a complimentary vibration in him." 12. "Death, of course, like chastity, admits of no degree; a man is dead or not dead, and a man is just as dead by one means as by another; but it is infinitely more horrible and revolting to see a man shattered and eviscerated, than to see him shot. And one sees such things; and one suffers vicariously, with the inalienable sympathy of man for man. One forgets quickly. The mind is averted as well as the eyes. It reassures itself after that first despairing cry: "It is I! ""No, it is not I. I shall not be like that. "And one moves on, leaving the mauled and bloody thing behind: gambling, in fact, on that implicit assurance each one of us has of his own immortality. One forgets, but he will remember again later, if only in his sleep." 14. "Love has a way of cheating itself consciously, like a child who plays at solitary hide-and-seek; it is pleased with assurances that it all the while disbelieves." 15. "Every wife who slaves to keep herself pretty, to cook her husband's favourite meals, to build up his pride and confidence in himself at the expense of his sense of reality, to be his closest and effectively his only friend, to encourage him to rejectthe consensus of opinionand find reassurance only in her arms is binding her mate to her with hoops of steel that will strangle them both." 16. "I had once believed that we were all masters of our fate--that we could mold our lives into any form we pleased... I had overcome deafness and blindness sufficiently to be happy, and I supposed that anyone could come out victorious if he threw himself valiantly into life's struggle. But as I went more and more about the country I learned that I had spoken with assurance on a subject I knew little about... I learned that the power to rise in the world is not within the reach of everyone." 17. 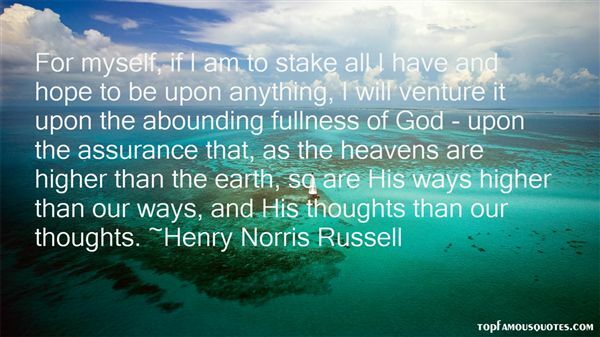 "For myself, if I am to stake all I have and hope to be upon anything, I will venture it upon the abounding fullness of God - upon the assurance that, as the heavens are higher than the earth, so are His ways higher than our ways, and His thoughts than our thoughts." 18. "The power of a bold idea uttered publicly in defiance of dominant opinion cannot be easily measured. Those special people who speak out in such a way as to shake up not only the self-assurance of their enemies, but the complacency of their friends, are precious catalysts for change." 19. "Ferbin's father had had the same robustly pragmatic view of religion as he'd had of everything else. In his opinion, only the very poor and downtrodden really needed religion, to make their laborious lives more bearable. People craved self-importance; they longed to betold they mattered as individuals, not just as part of a mass of people or some historical process. They needed the reassurance that while their life might be hard, bitter and thankless, some reward would be theirs after death. Happily for the governing class, a well-formed faith also kept people from seeking their recompense in the here and now, through riot, insurrection or revolution." 20. "When he thought of her, it rather amazed him, that he had let that girl with her violin go. Now, of course, he saw that her self-effacing proposal was quite irrelevant. All she had needed was the certainty of his love, and his reassurance that there was no hurry when a lifetime lay ahead of them. Love and patience- if only he had had them both at once- would surely have seen them both through." 21. "My films are expressive of a culture that has had the possibility of attaining material fulfillment while at the same time finding itself unable to accomplish the simple business of conducting human lives. We have been sold a bill of goods as a substitute for life. What is needed is reassurance in human emotions; a re-evaluation of our emotional capacities." 22. "Novelty. Security. Novelty wouldn't be a bad title. It had the grandness of abstraction, alerting the reader that large and thoughtful things were to be bodied forth. As yet he had no inkling of any incidents or characters that might occupy his theme; perhaps he never would. He could see though the book itself, he could feel its closed heft and see it opened, white pages comfortably large and shadowed gray by print; dense, numbered, full of meat. He sensed a narrative voice, speaking calmly and precisely, with immense assurance building, building; a voice too far off for him to hear, but speaking. 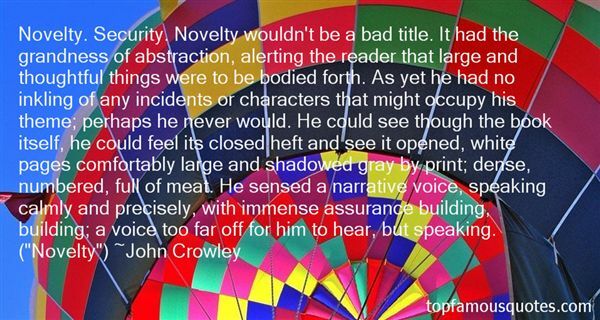 ("Novelty")"
23. "Having decisions made not in midnight deals but in the light of objective evidence and after consulting those who will be affected should itself provide some reassurance that the EU is trying to reform itself." 24. "Never worry alone. When anxiety grabs my mind, it is self-perpetuating. Worrisome thoughts reproduce faster than rabbits, so one of the most powerful ways to stop the spiral of worry is simply to disclose my worry to a friend... The simple act of reassurance from another human being [becomes] a tool of the Spirit to cast out fear -- because peace and fear are both contagious." 25. "A Frenchman's self-assurance stems from his belief that he is mentally and physically irresistibly fascinating to both men and women. An Englishman's self-assurance is founded on his being a citizen of the best organized state in the world and on the fact that, as an Englishman, he always knows what to do, and that whatever he does as an Englishman is unquestionably correct. An Italian is self-assured because he is excitable and easily forgets. A Russian is self-assured simply because he knows nothing and does not want to know anything, since he does not believe in the possibility of knowing anything fully." 26. "Formerly...when he tried to do anything for the good of everybody, for humanity...for the whole village, he had noticed that the thoughts of it were agreeable, but the activity itself was always unsatisfactory; there was no full assurance that the work was really necessary, and the activity itself, which at first seemed so great, ever lessened and lessened till it vanished. But now...when he began to confine himself more and more to living for himself, though he no longer felt any joy at the thought of his activity, he felt confident that his work was necessary, saw that it progressed far better than formerly, and that it was always growing more and more." 27. "And there in the middle, high above Prechistensky Boulevard, amidst a scattering of stars on every side but catching the eye through its closeness to the earth, its pure white light and the long uplift of its tail, shone the comet, the huge, brilliant comet of 1812, that popular harbinger of untold horrors and the end of the world. But this bright comet with its long, shiny tail held no fears for Pierre. Quite the reverse: Pierre's eyes glittered with tears of rapture as he gazed up at this radiant star, which must have traced its parabola through infinite space at speeds unimaginable and now suddenly seemed to have picked its spot in the black sky and impaled itself like an arrow piercing the earth, and stuck there, with its strong upthrusting tail and its brilliant display of whiteness amidst the infinity of scintillating stars. This heavenly body seemed perfectly attuned to Pierre's newly melted heart, as it gathered reassurance and blossomed into new life." 28. "Formerly (it had begun almost from childhood and kept growing till full maturity), whenever he had tried to do something that would be good for everyone, for mankind, for Russia, for the district, for the whole village, he had noticed that thinking about it was pleasant, but the doing itself was always awkward, there was no full assurance that the thing was absolutely necessary, and the doing itself, which at the start had seemed so big, kept diminishing and diminishing, dwindling to nothing; while now, after his marriage, when he began to limit himself more and more to living for himself, though he no longer experienced any joy at the thought of what he was doing, he felt certain that his work was necessary, saw that it turned out much better than before and that it was expanding more and more." 29. "No its you," she said. How far away her voice sounded, as though it had traveled to London already, ahead of her. "Your ducal self assurance. Everything will give way to you. Even Satan's own storm. ""You are definitely improving," he said. "Full mocking sentences." 30. "Then no matter where you are, in a crowded restaurant or on some desolate street or even in the comforts of your own home, you'll watch yourself dismantle every assurance you ever lived by. You'll stand aside as a great complexity intrudes, tearing apart, piece by piece, all your carefully conceived denials, whether deliberate or unconscious. And for better or worse you'll turn, unable to resist, though try to resist you still will, fighting with everything you've got not to face the thing you most dread, what is now, what will be, what has always come before, the creature you truly are, the creature we all are, buried in the nameless black of a name.And then the nightmares will begin." 31. "Speak quietly to yourself & promise there will be better days. whisper gently to yourself and provide assurance that you really are extending your best effort. console your bruised and tender spirit with reminders of many other successes. offer comfort in practical and tangible ways - as if you were encouraging your dearest friend. recognize that on certain days the greatest grace is that the day is over and you get to close your eyes. tomorrow comes more brightly..."
32. 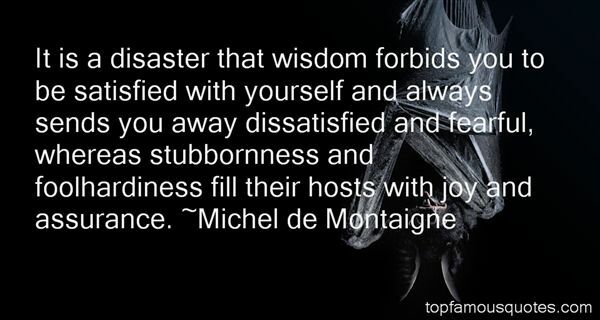 "It is a disaster that wisdom forbids you to be satisfied with yourself and always sends you away dissatisfied and fearful, whereas stubbornness and foolhardiness fill their hosts with joy and assurance." 33. "Slowly, then all at once.Slowly, as I take my time to know the things that would endear me to you. Slowly, as I attempt to cultivate a bond I hope would never easily sever. Slowly, as I get to know all your demons, and try to decide if I'm okay living with them everyday. Slowly, I also unleash my demons on you, hoping they won't make me look ugly, wouldn't make you think less of me.Slowly, as I let myself get used to the idea that you can be a possible permanent fixture in my life. Slowly, as I tell the difference between what I think I see, and what's really there. Slowly, as I find myself looking to you for reassurance that hey, I'm alright. Slowly, as I find my thoughts drifting toward you when I see or hear or find things that remind me of you. Slowly, as I catch myself dedicating to you all of the pieces that I've been writing." 34. "Once you lose everything, what's the worst that's going to happen to you? You develop a self-assurance." 35. "Indeed, compulsive and rigid moralism arises in given persons precisely as the result of a lack of sense of being. Rigid moralism is a compensatory mechanism by which the individual persuades himself to take over the external sanctions because he has no fundamental assurance that his own choices have any sanction of their own"
36. "How arrogant - how very far from humility - would be the self-satisfied, smug assurance that God, a tidy-up-after-us God will come and clean up our mess? Hope for a nanny God, who will with a miracle grant us amnesty from our folly - that's not aligned with either history or the text of the Bible." 37. "I hope you forgive the unedifying sight of my struggle to express some of the truths of my inner self and to measure the distance between the mask of security, ease, confidence and assurance I wear (so easily that its features often lift into a smirk that looks like complacency and smugness) and the real condition of anxiety, self-doubt, self-disgust and fear in which much of my life then and now is lived." 38. "A little thing, like children putting flowers in my hair, can fill up the widening cracks in my self-assurance like soothing lanolin." 39. "Remind Youth: It is not necessary to look for confidence. It is there – potentially yours and never hidden; awaiting a commanding voice of faith, hope and affirmation. Speak repetitiously with authority and conviction the self-assurance which only seems lacking, but you simply lost touch with." 40. "I want so desperately to bridge the gap between our bodies. I want to press my lips to every part of him and I want to savor the scent of his skin, the strength in his limbs, in his heart. I want to wrap myself in the warmth and reassurance I've come to rely on. -Juliette"
41. "We are uncomfortable because everything in our life keeps changing -- our inner moods, our bodies, our work, the people we love, the world we live in. We can't hold on to anything -- a beautiful sunset, a sweet taste, an intimate moment with a lover, our very existence as the body/mind we call self -- because all things come and go. Lacking any permanent satisfaction, we continuously need another injection of fuel, stimulation, reassurance from loved ones, medicine, exercise, and meditation. We are continually driven to become something more, to experience something else." 43. "BOTTOMThere are things in this comedy of Pyramus and Thisby that will never please. First, Pyramus must draw a sword to kill himself; which the ladiescannot abide. How answer you that?SNOUTBy'r lakin, a parlous fear.STARVELINGI believe we must leave the killing out, when all is done.BOTTOMNot a whit: I have a device to make all well.Write me a prologue; and let the prologue seem tosay, we will do no harm with our swords, and thatPyramus is not killed indeed; and, for the morebetter assurance, tell them that I, Pyramus, am notPyramus, but Bottom the weaver: this will put themout of fear.QUINCEWell, we will have such a prologue; and it shall bewritten in eight and six.BOTTOMNo, make it two more; let it be written in eight and eight." Literatura e un Turn Babel de hartie;fiecare carte o treapta,fiecare biblioteca un etaj.Numai ca literatura are o tinta mai modesta,dar si mai dificila:sa ajunga la inima oamenilor."